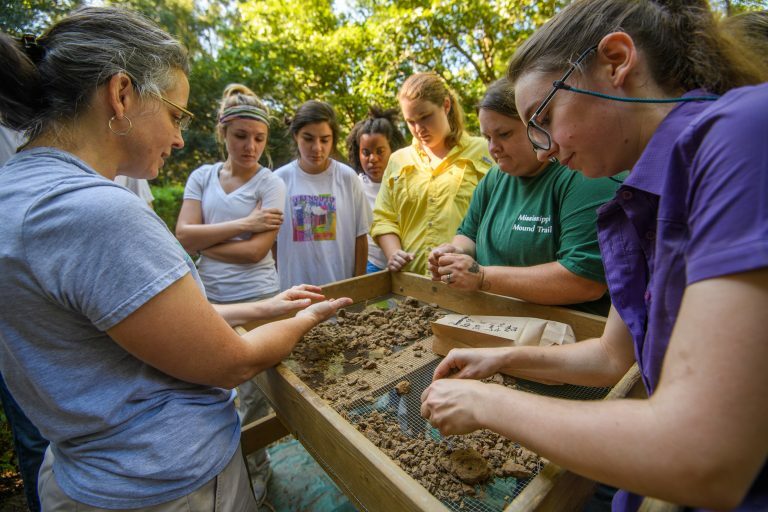 A University of Mississippi research group and the Center for Archaeological Research are conducting an archaeological investigation on the grounds of Rowan Oak in a search for evidence of slave life. The public is invited to see the progress at the site Saturday (Oct. 15) during Public Archaeology Day. The UM Slavery Research Group is interested in the pre-Faulkner era of the property, which was built in the late 1840s by Oxford settler and slaveholder Robert Sheegog. A census in 1850 showed nine slaves lived on the Sheegog Estate, yet there is no evidence of how they lived. The archaeological excavation is being conducted this semester by UM students under the direction of Tony Boudreaux, associate professor of anthropology and director of the Center for Archaeological Research, and Maureen Meyers, assistant professor of anthropology. It examines seven acres of cleared land surrounding the house at Rowan Oak. Students began their research by surveying the land and performing shovel tests, digging shallow holes to find intact deposits before further excavations, every 10 meters. These tests have resulted in several findings, including pieces of glass, ceramic, coal and brick. In the coming weeks, areas of artifact concentrations will be excavated intensively to try to identify remains of structures. Students will then sort, identify and analyze their findings, which also includes archival research at the Lafayette County Courthouse of land deeds and Sheegog’s will. 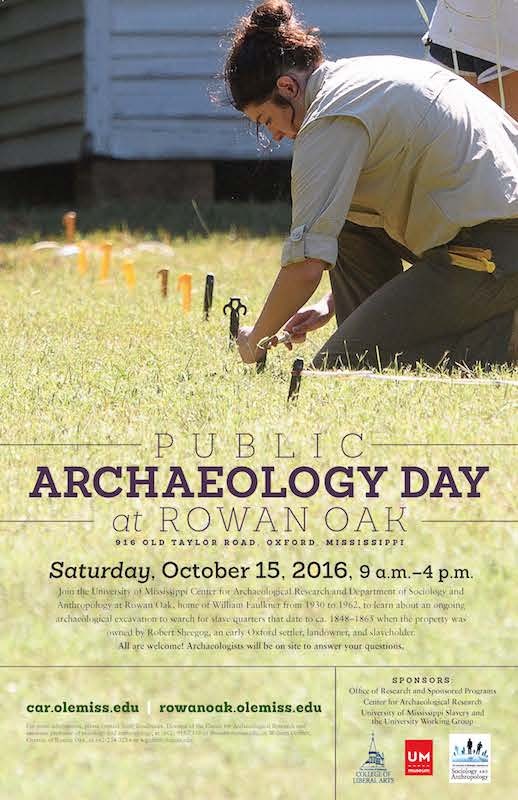 The public can learn more about the excavation and the search for slave quarters from 9 a.m. to 4 p.m. Saturday on the Rowan Oak grounds. The admission fee to the house will be waived for visitors that day, but donations will still be accepted. “This project is an opportunity to better understand the role of slavery in Oxford and beyond, and it is the first systematic attempt to archaeologically identify the remains of slavery on university grounds in the Deep South,” said Chuck Ross, group cochair, director of African American Studies and professor of history. In conjunction with the archaeology event, the University Museum will host a Let’s Move Family Activity Day, where children of all ages can explore art and nature by making their way through the museum and to Rowan Oak by way of the Bailey Woods Trail. The free activity runs from 10 a.m. to noon, and no pre-registration is needed. Parking at Rowan Oak is limited. To accommodate overflow, shuttle transportation will be available from the Old Taylor Lot. Restrooms will also be available onsite. For more information about the excavation, visit http://car.olemiss.edu. To keep up with the latest information from the UM Slavery Research Group, follow on Facebook and Twitter.